Bradley Putters make locally sourced, bespoke flatsticks for players who appreciate art—and performance. Putting used to be considered the most artful of golf skills, and putters were the paintbrushes. Think Ben Crenshaw and his Cézanne-like stroke, with the equally elegant “Little Ben” blade in hand. Nowadays, it's all about maximized moment of inertia, tight tolerances and CNC milling. On the greens as elsewhere, golf can feel almost numbingly sterile at times, with engineering trumping aesthetics. Ask an Equipment Expert: Are fully milled putters worth the money? So it's ironic that the man behind some of the world's most beautiful putters used to design military equipment meant to withstand nuclear blasts. But faced in 2016 with a job move that would have taken him and his young family far from his native southern Oregon, Brad Converse took an unlikely leap of faith. 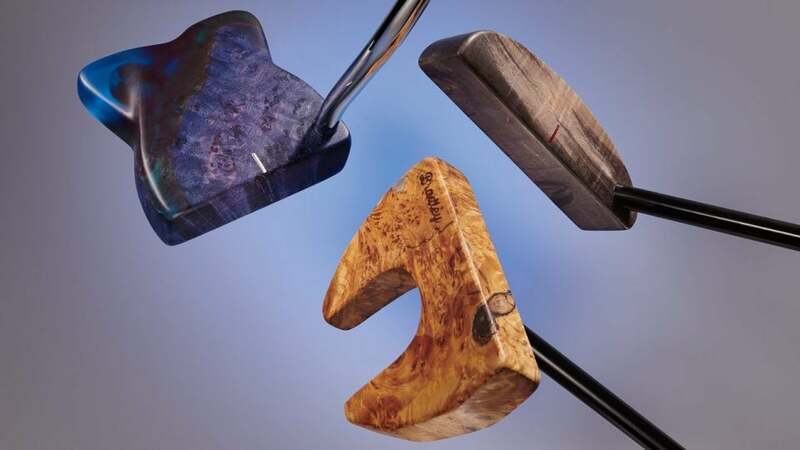 Inspired by a shopping excursion to The Real Mother Goose, a Portland gallery featuring the work of American artists and craftspeople, including woodworkers, Converse, a lifelong golfer and whittler, had a Eureka moment: Build putters out of burl wood. Bradley Putters are made from unique materials, like this Black Tiger Stripe Japanese Maple. A week later, he had prototypes in players' hands. Today, a little more than two years since Bradley Putters took its first baby steps, the company has a handful of craftsmen—armed only with saws, sanders and a drill press (and, when requested, dyes for stunning colors and a laser for personalized engraving). They make locally sourced, bespoke flatsticks for players who appreciate art—and performance. The "Finley" model from Bradley Putters made from Maple Burl. Only a philistine could fail to see the beauty of a Bradley (which start at $600); the surprise is in the playability. The wood is stabilized and waterproofed with a vacuum process that removes water and replaces it with a chemical hardener, yielding a soft, feel-enhancing clubface and a club that doesn't have to be babied. Each wood block is also analyzed for density and hardness, which allows the builder to precisely weight the end product with hidden lead plugs to achieve the desired specs. The "Widowmaker" design from Bradley Putters, created from Blue Box Elder infused with Blue Aquarium Acrylic. Not only do you get to choose the wood block that will become your blade or mallet, you can also follow the creation process in real time, thanks to the company's advanced software. This way, if you happen to have your own Eureka moment during the roughly month-long build, your idea can be incorporated into the end product. The result: a unique piece of performing art in your golf bag.